The employee’s market caused that the employees faster decide to change their current job. Therefore, the challenge of contemporary companies has been to counteract staff turnover and build a stable organization. How to do it? We talked about it on November 28th this year during the conference organized by the Qualitas Foundation. The same day we’ve honored Laureates of EUROPEAN QUALITY CERTIFICATE® 2018. This time it was Mysłowice and the industrial interior of the Bończyk Shaft that became the center of talks about quality, management and contemporary approach to business. Inaugural speech: Employee market? Good with it! As the long-term vision of the company allows to avoid the surprising effects of the “employee market” was presented by Marek Śliboda, the president of Marco Sp. z o.o. On a daily basis, he manages the company, which is one of the few recognized as so-called turquoise organization. Mirosława Gerkowicz, Director of the Department for the Quality of Education WSEI Lublin. The discussion was moderated by Marcin Kałużny, President of the Board of the Qualitas Foundation. 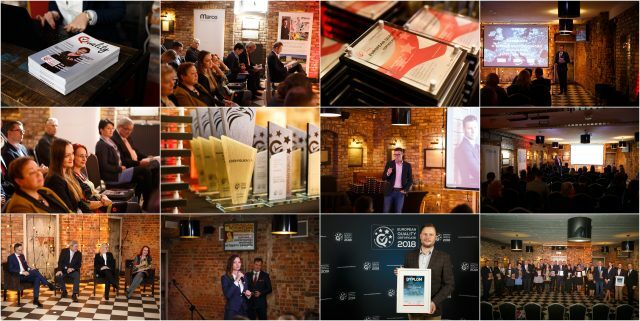 The culmination of the event was the gala, during which the Laureates of EUROPEAN QUALITY CERTIFICATE® 2018 were awarded diplomas and statuettes. The full list of awarded companies is placed in the latest edition of Quality Magazine. During the Gala, the Laureate of this year’s edition of the QUALITY IKAR competition was also announced. The awarded MA thesis was written by Andrzej Zakręcki, a graduate of the AGH University of Science and Technology Stanisław Staszic in Krakow. The sponsor of the PLN 2,000 prize was Protan Polska. We would like to thank the participants for the substantive discussion, and we would like to congratulate all of this year’s Winners once again, wishing them success and following the quality path.